When it came to the vote, the lower house, the House of Keys, supported Roy McDonald's amended resolution, but the upper house, the Legislative Council, voted unanimously against it. The House of Keys immediately adjourned to its own chamber and voted to continue with its previous decision to fight the imposition of unwanted mainland legislation. Ronan O'Rahilly who had witnessed the debate from the public gallery told waiting reporters afterwards that Radio Caroline North would remain in Ramsey Bay whatever the Manx or British Governments decided, any prosecutions of staff or advertisers which arose as a consequence would, he said, be fought all the way to the European Court of Human Rights. 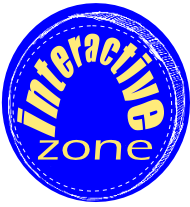 On 15th August 1967 Radio Caroline North was, technically, still not outlawed as were all other offshore stations. This anomaly occurred because the station's ship was anchored off the coast of the Isle of Man whose Government had refused to implement the Marine etc. Broadcasting (Offences) Act. 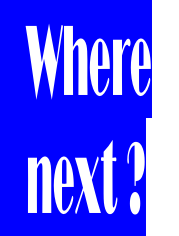 The Order in Council imposing the British version of the Act on the Island did not come into effect until 31st August 1967 so supplies and personnel could quite legitimately be transferred to and from the ship using the Island's ports. However, English staff on board the MV Caroline had decided, like their southern colleagues to quit the station on 14th August 1967 for fear of prosecution. DJs Tony Prince and Dave Lee Travis, newsreader Dave Williams and Canadian DJ Jerry King left the ship late in the afternoon of 14th August and arrived in Ramsey Harbour aboard Offshore III in the early evening to be met by a crowd of fans and well wishers. Earlier that day a similar crowd had seen five other DJs leave for the MV Caroline in defiance of the new law - Englishmen Dee Harrison, Martin Kayne and Mark Sloan, together with Canadian Don Allen and Australian Jimmy Gordon all joined the ship to continue Caroline North programming after August 15th. As the Marine etc. 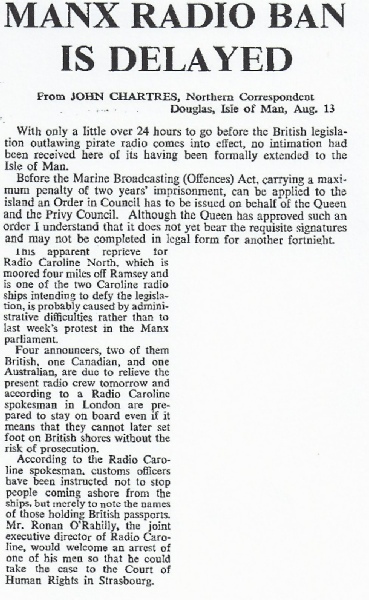 Broadcasting (Offences) Act was not actually applied to the Isle of Man until 31st August 1967 Radio Caroline North continued to be serviced from Ramsey for a further two weeks although such arrangements had now been outlawed on the British mainland. The last tender left Ramsey at 8.30pm on 31st August 1967 to make the final delivery of supplies and crew before the provisions of the British law became effective on the Isle of Man. 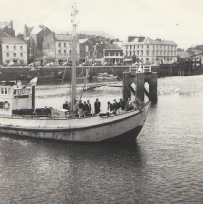 Also during the evening of 31st August 1967 the Isle of Man Steam Packet Company's ferry, Manxman took over 2,000 people on a special cruise from Douglas to Ramsey Bay, circling the MV Caroline. 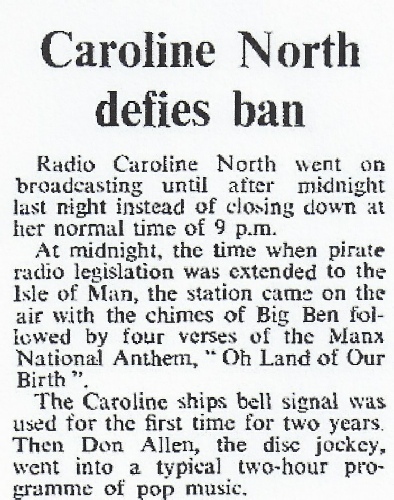 At midnight on 31st August, Don Allen, Senior DJ on Caroline North, played the Manx National Anthem, thanked the Isle of Man Government and people for their continued support and announced the continuation Radio Caroline International in defiance of the new law. . After a period of two weeks grace (and regular tender runs) because of a quirk in the legislative processes, Radio Caroline North and its crew had now officially joined its southern sister station in being totally isolated from Britain. Although they didn't know it at the time, it was to be another six weeks before a tender even visited the radio ship again. 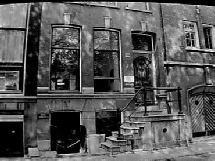 What really did keep Radio Caroline on the air financially after 14th August 1967 was the heavy promotion of Major Minor records featuring artists such as David McWilliams, Raymond LeFevre and his Orchestra, The Dubliners and the Roberto Mann Singers, as well as a large number of relatively unknown Irish folk singers. These 'plug' records -which numbered up to fourteen an hour at one point, were contained on a list supplied to both ships and DJs were instructed to play them to the exclusion of anything else they may have wished to include in their programmes.